Anuranga, C., J. Chandrasiri, R. Wickramasinghe,and R.P. Rannan-Eliya. Abstract:Cambodia is one of the poorest countries in the Asia and Pacific region, and is still emerging from decades of war, genocide, and social disruption. Despite robust economic growth in the past decade, three out of every ten Cambodians still live below the national poverty line. The destruction of most of the country�s health infrastructure and human resources during the years of conflict profoundly damaged the effectiveness of health service coverage, as well as retarded the development of health awareness of much of the population. Overall rates of healthcare use are among the lowest in Asia, reflecting significant physical and financial barriers to access. 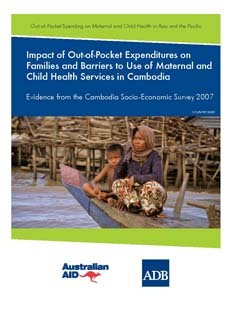 This country brief examines the impact of out-of-pocket expenditures for maternal and child services based on analysis of the Cambodia Household Income and Expenditure Surveys 2000-2010.